This actually comes in 2 versions - distinguished only by the ribbon - one for Prison Officers and one for other staff connected in some way with the prison service. The ribbon has equal stripes of green and dark blue either side of a light blue stripe. 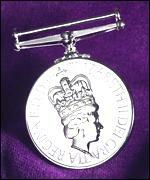 Medals for prison officers have a narrow red central stripe.